Thick slabs of cauliflower steak are delicious, well seasoned, and very satisfying. The easiness of this recipe is an added bonus! I love cauliflower steak! It’s my newest cauliflower discovery, and I’ve been making it quite often lately. 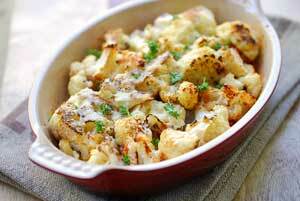 Imagine delicious, well-seasoned, creamy roasted cauliflower. Now imagine it in the form of thick, steak-like slabs. Thick slices of roasted cauliflower are very tasty and very satisfying. 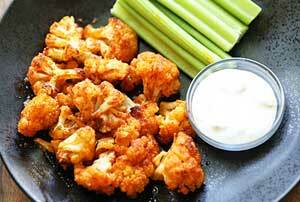 I think cauliflower is awesome in general – it’s delicious, healthy, and very versatile. I have quite a few cauliflower recipes on this blog that I make regularly for my family. I like cauliflower in general, but I especially like cauliflower steak. I always think of eggplant as a hearty, “meaty” vegetable. As it turns out, cauliflower can be just as hearty, when cooked in thick, steak-like slabs. It’s actually very easy. Slice, season, and roast in a hot oven. It’s one of the easiest cauliflower recipes I make. Scroll down to the recipe card for the detailed instructions. The only challenge here is that when you cut the cauliflower head into thick steaks, inevitably some of it will fall apart and turn into florets. That’s why you need 2 cauliflower heads for this recipe. What to serve with cauliflower steaks? You can serve this dish as a side dish to any meat. Sometimes I serve it with fried or poached eggs, for a hearty meatless meal. Since I roast the “steaks” in a 425°F oven, I like to serve them with a main dish that I can cook in the same oven, So I often serve them with Parmesan-crusted chicken or with baked salmon. You can keep leftovers in the fridge, in an airtight container, for up to 4 days. Reheat the leftovers gently, in the microwave on 50% power. Preheat oven to 425 degrees F. Line a large baking sheet with foil. Wash the cauliflower heads, trim the outer leaves and remove the core. Slice into 3/4-inch-thick slices. The outer slices will likely fall apart - you can simply roast them with the cauliflower steaks. Plan on getting 3 cauliflower steaks out of each cauliflower head. Brush both sides of the cauliflower steaks with the olive oil. Sprinkle with the seasonings. Place on the prepared baking sheet and bake 15 minutes. Carefully turn, and bake 15 more minutes, until browned and fork-tender.